These sleep headphones do the job! While they're not heavy duty, the company makes it relatively easy for consumers to maintain them for nightly use way beyond the warranty period---for a price. The founders of AcousticSheep—family physician Dr. Wei-Shin Lai and video game developer Jason Wolfe; a married couple, as well as company CEO and CTO, respectively—did not initially set out to create SleepPhones commercially. The product traces its roots to Dr. Lai’s nighttime sleep troubles. Music relaxed her and allowed her to drift off naturally, but she found that typical earphones were too uncomfortable to wear to bed. Her solution was to design and invent her own pair of sleep headphones—and they worked! So well, in fact, that she began offering the product to her patients that were sleep-deprived. Eventually, Lai and Wolfe patented the invention and started a real business. Today, SleepPhones come in many colors and design variations. As origin stories go, this one is more relatable than most; a manifestation, if you will, of the popular saying: “If you want something done right, do it yourself.” Lai had problems sleeping and she couldn’t find anything on the market to help with her troubles; so she and Wolfe created a solution. Here at Good Night’s Rest, we find that approach a positively inspiring way to support one’s sleep health! Whether the product lives up to the hype, though, is what we’ll be exploring below. As AcousticSheep grew over the years, variations of the original SleepPhones were added to the company’s product line—we’ll discuss this later on—but for the purposes of this review, we’re focusing on the SleepPhones Classic. Made in China and assembled in the USA, the design is simple; the patented “headphones in headband” invention serves a sleeping user well. The snug and cozy fit of the headband holds the slim earphones close to the ear without discomfort. The headbands come in three sizes and two different types of hypoallergenic fabric. There are also six color choices. The luxurious SheepCloud Fleece material is 95% polyester and 5% spandex; and is available in Midnight Black, Quiet Lavender, and Soft Gray. The lightweight SheepCloud Breeze material is 88% polyester and 12% spandex; and is available in Galaxy Blue, Sunset Pink, and Pink Leopard. In general, the former is for colder climates; while the latter, developed more recently, is for warmer climates. Both fabrics are machine washable, though we should point out that you do need to take out the internal headphone system through the provided opening—which is Velcro-secured—before cleaning the headband or otherwise submerging it in water. You can quickly put them back in, but do make sure that you do so properly. The speakers are marked for specific sides by colored stitching: red for the right side, and green for the left. The removable, lead-free electronic system inside the SleepPhones Classic is composed of felt-padded and very thin headphones connected to a braided audio cord that’s about four feet in length. The cord ends in a standard 3.5 mm audio jack, which fits most media players and smartphones that still accommodate headphones. SleepPhones actually come in three different kinds of packaging: eco-friendly, gift, and retail. What’s inside remains the same all throughout; that is, just the product. No physical bells and whistles here! However, it does come with a free mobile app and sleep sound downloads; note, though, that the app is only available for Apple products. These are headphones made for the sleep-deprived, and not for audiophiles; so please do manage your expectations. Of course, with the size and comfort limitations placed on the technology end of the product design, one cannot really expect professional grade and high-end sound quality. However, this is true for all sleep headphones. SleepPhones even share some specs with previously reviewed DubsLabs Bedphones. Both products have an impedance about 32 Ω and a frequency range of 20Hz-20kHz. 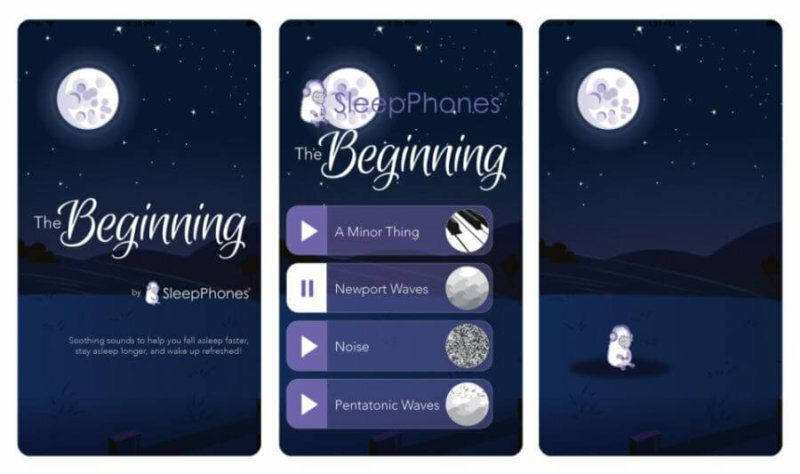 While quieter than normal earphones, SleepPhones do provide sufficient audio clarity! It is important to remember that they are not supposed to be noise-canceling products; rather, just a way for you to listen to relaxing music, podcasts, visualization exercises and other similar tracks while in a cozy and comfortable position. 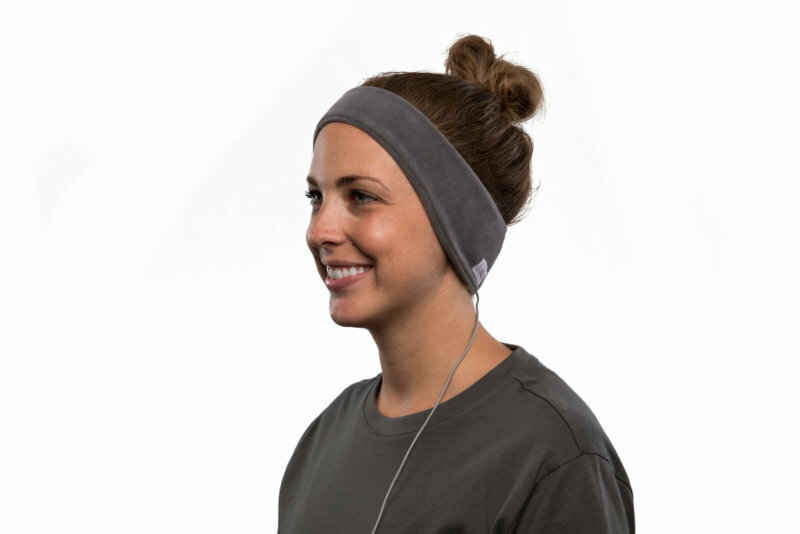 The headband helps keep the speakers in place; which allows you to hear what you’re listening to effectively, while cutting down on possible audio leaks that may otherwise disturb people around you. Many of the initial criticisms regarding the original design of SleepPhones have been addressed in later variations. For example, during our research we found out that some people have complained that the SheepCloud Fleece headband material was too heavy and caused some sweating. Enter: SheepCloud Breeze, which we already mentioned above. AcousticSheep has also made extra headbands—without headphones inside them—available for purchase, for easy replacing and washing. The internal headphone system is also available without an accompanying headband, should you want to replace your old pair. For sleepers that are prone to tossing and turning, there’s also a wireless version that features a Bluetooth connectivity range of up to 30 feet and a rechargeable battery life lasting up to 13 hours. You can charge SleepPhones Wireless using a provided USB charger; but if that’s still too “wired” for you, there’s also SleepPhones Effortless, which comes with an induction charging base. 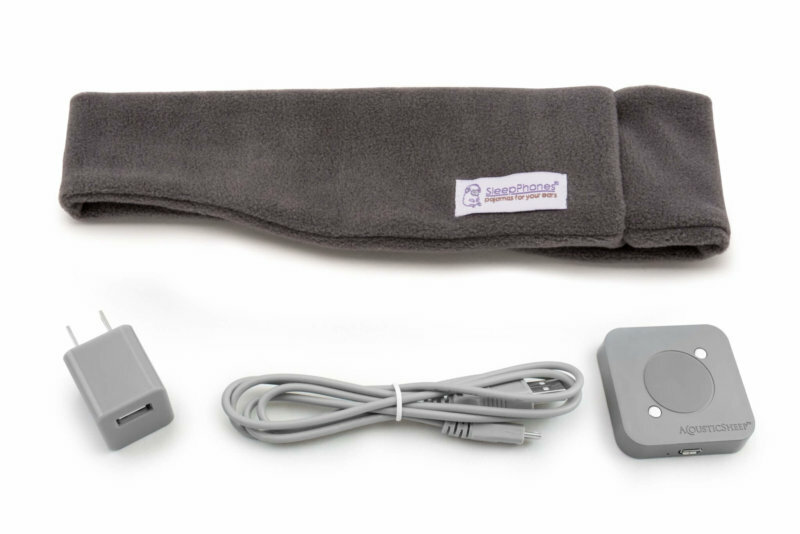 Other variants—like one with the inclusion of a microphone, for instance—seem to be geared towards adapting SleepPhones for other uses outside of sleep. There’s even a separate, sports-influenced line called RunPhones; which uses the same design, but a different fabric that’s better for wicking away sweat and moisture. If you are looking to use SleepPhones beyond the bedroom, you may want to consider looking through all of AcousticSheep’s offerings to find something that may work better for your lifestyle—instead of just sticking to SleepPhones Classic. SleepPhones Classic are literally plug-and-play. Although cord tangling may be an issue for active and restless sleepers, typical usage of this product usually just involves putting it on and plugging it into a compatible media player. Just make sure that the device you’re connecting it to is in a secure location. Even though the cord is four feet long, accidents can still happen. 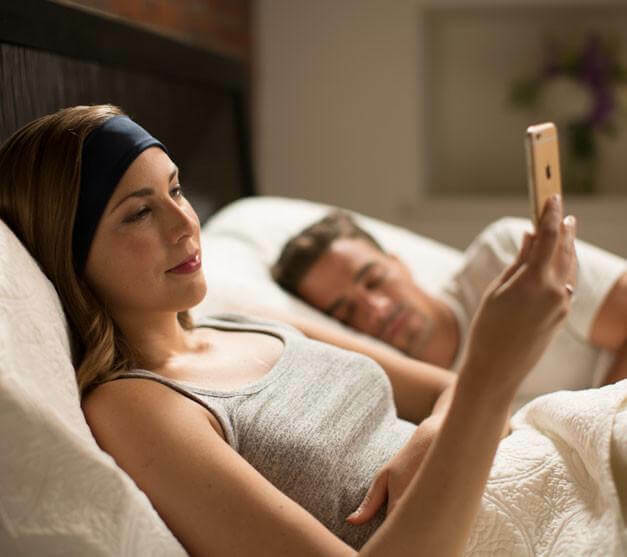 You don’t want to wake up in the middle of the night to go to the bathroom, forget you’re wearing SleepPhones Classic, and find out the hard way that you’ve been dragging and possible damaging your smartphone all over your floor. Directions for product use and care are available on the website in written and video form, too; if you’re interested in washing instructions and other related information. How Does It Feel to Wear Them All Night? In our research into this product, we did find some complaints regarding comfort; but not in the way we expected. Like other sleep headphones, we thought the bulk of the trouble would be from the product not staying on properly; but instead we found two different discomfort issues that kept on popping up. One had to do with the headphone cord getting wrapped around the neck during sleep; which is a problem with all wired sleep headphones. There is no fix for this other than to shift to a wireless version, and fortunately AcousticSheep does offer this option as part of their product line. Another, less prominent issue had to do with seam of the headband. People sleeping on their backs may find it irritating to have the seam directly where their head hits their pillow, but a simple solution is to just wear it backwards. Although that may result in the left speaker being above the right ear and vice versa, which is not ideal for something like a binaural beats playlist, it’s usually not a big deal otherwise. Side sleepers sometimes reported ears being a little tender upon waking, or slight displacement of speakers during sleep, but nothing truly disruptive. Most noted these slight difficulties with a parenthetical “you get used to it” or a similar sentiment. This company isn’t new. AcousticSheep was founded in 2007, and they have had time to refine their product offerings and respond to initial complaints by releasing variants and additions to the flagship SleepPhones Classic. This drive for improvement in itself is important to us here at Good Night’s Rest, as both reviewers and consumers. It is what we look for when we talk about promise and potential. Of course, it helps that the company is accredited by the Better Business Bureau, with an A+ rating! And we do appreciate the fact that the company’s official website is painstakingly maintained, filled with up to date information and very customer friendly. There are FAQs, instruction manuals, videos—and even a community newsletter. Customer support is provided via phone and email, and you can even send snail mail or a fax. Is There a Trial Period with a Return Policy? There is no trial period, but there is a one-year limited warranty. You do need to register the product you purchased to avail of this, though. How Good Is the Warranty? It seems standard for products of this kind; limited to manufacturing defects, and not covering malfunction due to improper handling or misuse. The company retains the option to either repair or replace defective parts, and in cases of the product no longer being on the market, the replacement will be a product of a similar or better design. This warranty only applies to products purchased on the official website or through authorized resellers, and—specifically for the wireless variants—does not cover the battery. SleepPhones Classic are $39.95, both on the official website and on Amazon; as of this writing. SleepPhones Wireless is much more expensive at $99.95; and SleepPhones Effortless, with its induction charging technology, even more so at $129.95. 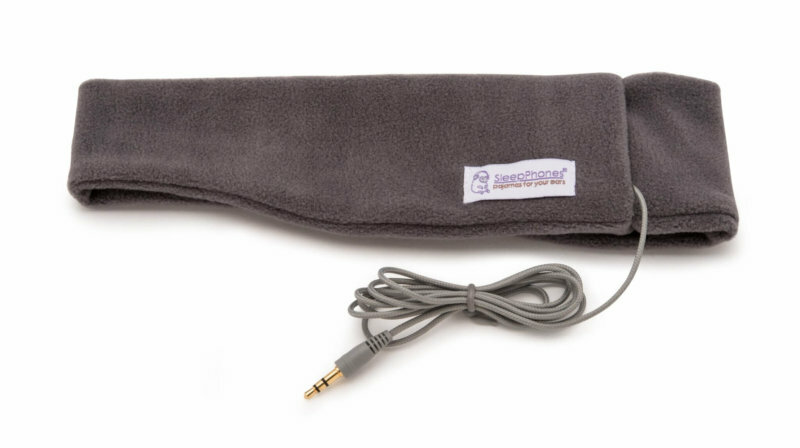 Even if you’re past the one-year warranty mark, it’s easy to maintain your SleepPhones Classic—as we’ve previously covered in this review—because AcousticSheep sells replacement headbands and internal headphone systems separately. The former retails for $19.95, while the latter is at $29.95. We’ve gone through literally thousands of customer reviews of SleepPhones Classic, and the only complaints we’ve seen are ones that exist for all corded sleep headphones at this price point—wires tangling and fraying due to tossing and turning, slight ear discomfort for some people, and overall flimsy material and design. Sleep headphones are a curious and surprisingly difficult product to design, after all. Too durable and you risk making it uncomfortable; too comfortable and you end up with a product that’s not expected to properly function for more than a year. What SleepPhones does have over its competitors is above average customer support. We like the fact that beyond the warranty, there is a way to buy replacement parts, instead of having to buy the entire product again. If you really need sleep headphones, don’t need noise-canceling, and don’t mind spending for a product that’s cozy, comfortable—but will probably need regular maintenance and new parts—SleepPhones are a good choice. We definitely recommend them! © 2018 - Good Night's Rest. All rights reserved.